No doubt many of you would have heard the sad news this morning that Baroness Margaret Thatcher has passed away last time after battling dementia and poor health for some time. But while many around the world have proffered their condolences and reflected with genuine sadness at the passing of one of the 20th century’s political heavyweights, it has also been met with barbarous cries of happiness across not only Britain, but also here in Australia. Showing dignity and respect for the dead? Not for some of the callous barbarians that inhibit the den of mediocrity that is the so called “progressive” Left around the globe. A despicable and vile Facebook event has been set up to mark the event here in Australia, which in it’s own words seeks to celebrate the death of one of their indefatigable opponents, a woman of immense personal and political courage who dragged Britain kicking and screaming from the death throes of socialism. All good union women and men, all progressives, all anti-war activists are duty bound to celebrate this great occasion to mark the death of a British Conservative responsible for destroying so many lives. So, what better way to respond than with a celebration! A celebration of the lives of those who struggled against her and an affirmation to continue the fight against the 1% for whom she ruled, political conservatism, and all her modern-day incarnations. What these disgusting examples of human kind neglect to mention is that Thatcher won three successive elections, which should put paid to any notion that she only represented “the 1%” (a very recent term coined by the Occupy rabble). The overwhelming majority of Britain voted for Thatcher and her policies and whilst they included some tough love for a country racked by class warfare and antiquated ideals of a bygone era, she dragged that once proud country back to its feet. What Thatcher did to raise their ire was to smash the choker hold that the trade union had over the British people in the late 1970’s and early 1980’s. Tim Blair has a wonderful example of the type of union idiocy that Britain had to deal with before Thatcher had the mettle to crush. Copy could be typed by others on the paper, including journalists, but it had to be retyped by NGA members. In the days of hot metal presses this made sense, but the new computer-based technology meant that copy only needed to be ‘single-keyed’, i.e. it could be typed and set straight into the system … [By 1979] the NGA had already established the double key-stroking principle at three other national newspapers. So in this example we can see that the relevant union not only resisted technological advancement that made work easier and more productive, but also added another unbelievable layer of bureaucracy and redundancy in an effort to “not kill the job“, which if you have ever worked in a union environment as I have is code for stretching the work out as much as possible in order to squeeze as much benefit (to unionists only) out of any given situation. No matter what you political leanings there should always be some modicum of decorum shown to someone who devoted their entire life to the betterment of her own people and others not so blessed to have her guiding their own country. Thatcher was instrumental in helping Ronald Reagan bring bold new age to the USSR, supporting Mikhail Gorbachev to usher in the period of perestroika (restructuring) and providing glasnost (freedom) to a people isolated from the rest of the world behind the Iron Curtain. Let it be said, immediately and unequivocally: Margaret Thatcher was the finest prime minister of the post-war era, the only British politician in modern times to change Britain – and so much for the better. As her aide Ferdinand Mount once said of her – and he was by no means blind to her faults – she made Britons believe that things were possible: that we could revive ourselves through a sheer act of will and by blocking our ears to the enemies of progress. The intensity of the hatred she inspired was, paradoxically, a tribute to her. No one who changes the way a country works, to put it bluntly, can do so without implementing policies that hurt people. She knew that, and regretted it, for she was a kind lady. But Britain is enormously in her debt. This is an immensely sad day. Baroness Margaret Thatcher definitely had enemies and she certainly stood for something. She stood proudly against Socialism and the mediocrity that such a political philosopy brings to it’s adjuncts. Her last speech to the House of Commons shows an unflinching politician stand defiantly, willing to take every barb on the chin, and then counter all arguments with a rapier sharp wit and cutting intellect without once resorting to shrieks of misogyny and sexism. Australian’s will also fondly recall Thatcher putting one of our very own sneering lefties in his place, when she calmly and politely put George Negus back into his box on national television. The look on Negus’ face and watching him squirm in front of us all has only been bettered when Negus had to offer a grovelling apology to Victoria Cross and Medal for Gallantry recipient Corporal Ben Roberts-Smith, one of Australia’s fearless modern day war heroes who selflessly provides the protection those on the Left take for granted. This was a woman who stood tall amongst the greats of the 20th century and her passing deserves to marked with dignity not disgraceful cheers from the barbarians amongst us. But don’t let that stop the Left and their disgusting vitriol and unbridled joy at the passing of The Iron Lady. 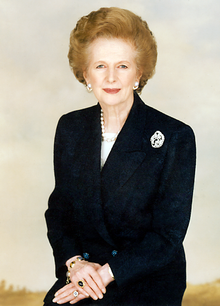 Vale Baroness Margaret Thatcher 1925 – 2013.